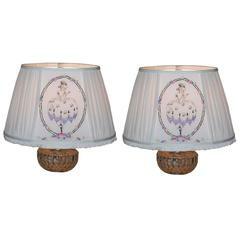 Set of 4 paper lampshades made for two lights. Each is hand painted with images of swags and urns of flowers. Good antique condition. One shade has a hole in it. New -old stock. Rustic Iron finished exterior lanterns with slag glass. Two lights each. 10.25 projection. Two candelabra bulbs in each lantern. 19th century brass chandelier. Six lights, very dramatic. 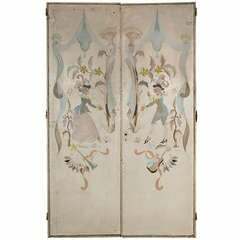 Beautifully painted 1940s doors or panels. 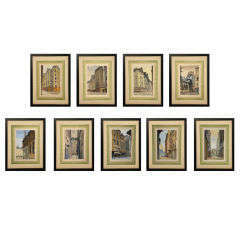 Moody Paris street scene watercolor paintings, framed. Six paintings are available. 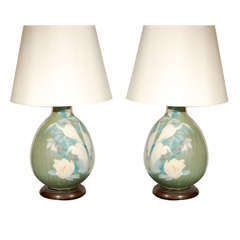 Pair of elegant table lamps. Hand-painted ceramic body of green and blue coloring of cranes with white roses. Custom ivory silk shades and brass base. 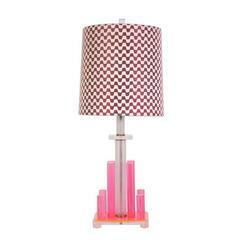 Pink Lucite Table Lamp with Custom Missoni Lampshade Lampshade also available to be sold separately Lampshade dimensions: Top / Bottom Diameter - 10.5'' Height - 11''. 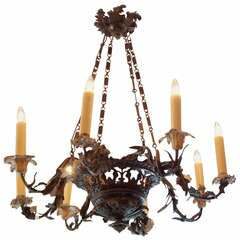 French lead hand painted eight arm chandelier with floral motif. Originally candle powered. Dealers please call for trade price.